As both average temperatures and rainfall counts continue to climb, government agencies, businesses and other organizations are seeking ways to ensure that Virginia is prepared to withstand whatever changes are caused by changing weather patterns. To convene a conversation about rural resiliency concerns, Resilient Virginia held a forum on October 23 at the Frontier Culture Museum in Staunton that covered how the fields of agriculture and emergency management are responding, as well as how efforts are being made to build robust “green infrastructure” to help address both water quality and stormwater management. The objective was to explore the co-benefits of using natural systems and sustainable agriculture practices to assist with mitigating effects from severe storms, flooding, and other climate-related risks. The goal was to improve collaboration among state and local governments, as well as rural businesses and communities, to improve the “storm readiness” of farms, forests, and natural resource areas, and to increase the resiliency and prosperity of rural areas of the Commonwealth. In addition, the Forum looked to provide access to existing resources, state and federal programs and funding, as well as start a conversation about potential policy recommendations. “Our mission at Resilient Virginia is to accelerate resiliency planning throughout Virginia,” said Andrew Sorrell, Deputy Director of the Virginia Tobacco Region Revitalization Commission and Chairman of the Resilient Virginia Board of Directors. The organization was formerly known as the Virginia Sustainable Building Network, but they rebranded in 2013 to take on the new challenge of helping communities adapt to climate, social and economic challenges. Resiliency is defined as “the ability to mitigate risk, while building the capacity to regain functionality and vitality in the face of chronic stressors or severe disturbances.” That definition covers a lot of subject areas, but the October forum focused on resilient agriculture and forestry, blue and green infrastructure, and hazard mitigation and emergency preparedness. Erik Curren, a member of Staunton’s City Council, welcomed participants and commented that many people in the Shenandoah Valley had thought that only coastal communities would be affected by climate change. 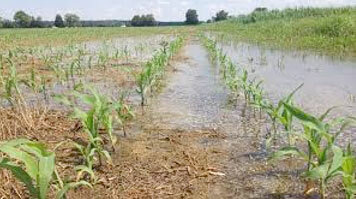 Farmers now report that they are being affected and that crops are changing. Tourism officials are also saying that they are beginning to be affected, especially with the wet weather. “Resiliency is our problem, too,” Curren said. “Help us help rural Virginia communities weather what’s coming,” Curren said. Speakers presented on related state and federal programs, as well as on current resiliency projects and activities happening throughout the Commonwealth. During lunch, university representatives provided information on how university programs can help with community resiliency needs. In the afternoon, interactive breakout sessions encouraged audience, speakers, and Resilient Virginia staff to delve further into particular issues and challenges around rural resiliency and how farms and natural resource areas can help with hazard mitigation and disaster preparedness. The timber industry has a $17 billion impact on the state’s economy, according to Robbie Talbert, Regional Forester-Central Region with the Virginia Department of Forestry. One in four manufacturing facilities in the state produce a forestry-related product. In all, there are over 104,000 jobs. The continued success of the industry depends on having forests, and this relies on landowners who want to continue to maintain forests as their primary land use. “More landowners want to keep their land in their family,” Talbert said, adding that the average age of a forested property owner is 67. They are also overwhelming male and overwhelmingly white. Nearly three-quarters of forest owners live on their own property. To try to add balance to the demographics, the Department of Forestry runs a program called Generation NEXT which seeks to build the next cohort of dedicated landowners. Another program called Century Forests covers landowners who have wooded lands in their possession for over a hundred years. 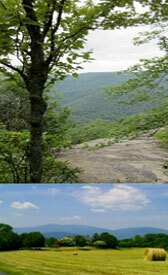 There are 39 forests in Virginia that qualify with 14,446 acres. Maintaining tree cover, which plays a significant role in both storm and flood mitigation, as well as reducing nutrient loads for waterways, is also addressed by the Department of Conservation and Recreation. Kristin Owen, Floodplain Program Manager with the Virginia Department of Conservation and Recreation (DCR), informed the audience about their Soil and Water Program, which works with farmers to help prevent pollution runoff by encouraging tree buffers along waterways, and the Floodplain Management and Dam Safety program. They also work with communities to encourage their participation in the Federal Emergency Management Agency (FEMA) flood insurance programs. One of the biggest topics at the forum was how agricultural practices may change as weather patterns continue to shift. One speaker on hand was Kathy Holm, Assistant State Conservationist for Field Operations with the United States Department of Agriculture-Natural Resources Conservation Service. “I’ve noticed the [increasing] intensity of hurricane and rainfall events, which is expected to continue into the future,” Holm said. To start, Holm led with some definitions. 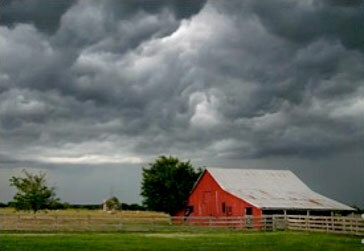 Weather is the hourly and daily variation of meteorological conditions in the atmosphere. Climate, on the other hand, is the average weather over time. Changes in climate can be tracked by tracking impacts on crops and livestock, as well as the insects, diseases and weeds that can affect them. According to the USDA, annual average temperatures will continue to increase by 3 to 6 degrees Fahrenheit by the middle of the century. Heat waves will continue to become more intense. Rainfall is expected to continue to increase in Virginia, but in powerful bursts that could come with long dry spells. In addition, the growing season will be longer. To offer help, the USDA has created regional Climate Hubs that provide information for farm and forest adaptation responses. They also offer adaptation workbooks for agriculture, urban forests, and forest owners to help them engage in a process of identifying risks and working on solutions. Closer to home, Julie Shortridge, Ph.D., Assistant Professor and Extension Specialist, with Virginia Tech’s Department of Biological Systems Engineering, reviewed the types of climate risks facing the region. Julie Shortridge told the audience that rising temperatures are projected to reduce yields for corn and soybeans. 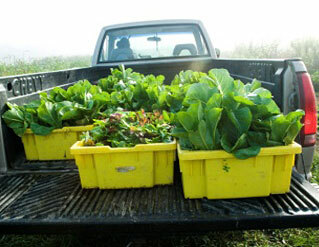 To try to improve the economic hit to farmers, Shortridge advocates for “climate-smart” farming which includes using drought and heat-resistant varieties, improved soil health and using better weather forecasting to make long-term decisions about what to plant each season. “This is how to build resilience,” Shortridge said. Shortridge urged farmers to contact the Virginia Cooperative Extension for more resources. She also emphasized that throughout history, those in agriculture have always had to contend with a shifting climate. “Climate change and other pressures have made some of these risks more challenging,” she said. Leonard Githinji, Ph.D., Assistant Professor and Extension Specialist at Virginia State University, offered a few lessons about sustainable agriculture. “Sustainable agriculture includes practices that do not harm the environment, practices that provide fair treatment of workers, and practices that support and sustain local communities,” Githinji said. 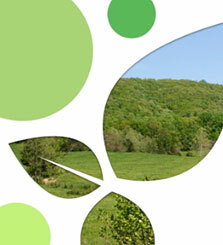 This includes the practice of multicropping, where many species are planted on the piece of land. One benefit of this is higher genetic diversity, which leads to more resilient soil. A more intense form known as intercropping involves deliberately selecting plants which benefit from each other’s presence. Sustainable agriculture also makes sure that there is habitat for pollinators. 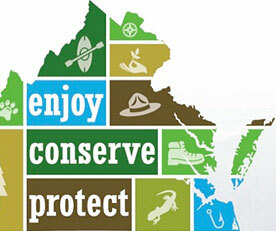 Karen Firehock, the Executive Director of the Green Infrastructure Center (GIC), had the opportunity to explain how her organization creates plans to protect and enhance the ecological carrying capacity of Virginia and other states. “The Green Infrastructure Center helps communities evaluate their green assets to maximize ecological, economic and cultural returns,” said Karen Firehock. In addition to Firehock’s home county of Albemarle, the Green Infrastructure Center has also worked in Accomack County, Virginia; Darlington County, South Carolina; and Ulster County, New York. GIC publications on green infrastructure have been developed for local and state governments both in Virginia and nationally. The term “green infrastructure” was coined in 1994 by the state of Florida in a report on land conservation strategies. The idea was to demonstrate that planners should take into account natural systems as providing services to developed areas. This can take the form of raingardens, bioswales or green rooftops. In addition, planning for green infrastructure encourages preserving contiguous rural landscapes and conserving forests and wetlands. “The more connected the landscape, the more resilient it is,” Firehock said. Green infrastructure plans encourage building in the least impactful manner to preserve the natural landscape’s ability to reduce stormwater and maintain water quality, and then mitigating man-made structures to the highest level possible. At a locality-wide level, that can mean thinking about wildlife bridges and other ways to provide safe passage for migrating creatures, as well as recreational areas for communities. Firehock also referred the audience to an online tool — DCR’s Virginia Natural Landscape Assessment — that can be used to find out more about the natural resource areas in their regions. Stacie Neal, Critical Infrastructure Protection Program Manager, Governor’s Office of Public and Homeland Security, offered information on the state’s role in disaster protection, prevention, and mitigation, as well as programs to increase resiliency. She informed us that there are a variety of “critical infrastructure” areas, that include not only government facilities and emergency services, dams, and critical manufacturing, but also agriculture, water and wastewater facilities, and public health. 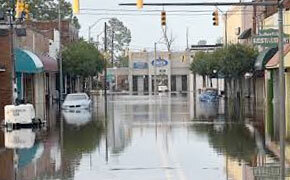 Virginia Department of Emergency Management (VDEM), the state agency that handles disaster planning and response, has the goal of working with the whole community, including families, businesses, local government, and community organizations, to develop both mitigation and emergency response plans. Mitigation strategies that help to lessen the impact of storms and other emergencies are increasingly important with the more frequent severe weather events, including tornadoes, flooding, and high wind, that communities have been experiencing. The local challenges of rural mitigation and emergency planning were further elaborated on by Rebecca Joyce, Community Program Manager of the Central Shenandoah Planning District Commission, and Jonathan Simmons, All-Hazards Planner, VDEM Region 6. Rebecca Joyce, working with VDEM, manages emergency response, flood management, and mitigation plan development for rural localities in the PDC region. She commented on the difficulties encountered by local communities in preparing for disasters with very limited staff and funding resources. Lunchtime presenters from state universities gave the audience an overview of several programs that combine student academic work with community assistance in the resiliency, agriculture, and energy areas. 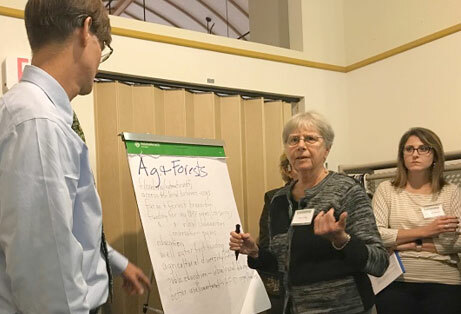 Kim Niewolny, Ph.D., Associate Professor with the Department of Agricultural, Leadership & Community Education at VA Tech, provided information on two programs — the Virginia Beginning Farmer and Rancher Coalition and the AgrAbility Program. The Coalition’s goal is support new farming and ranching endeavors to be successful through farm planning assistance, training, mentoring, and online resources. AgrAbility Virginia assists individuals and their families who farm, and have illnesses, injuries or disabilities that are impeding their ability to work safely, effectively, and productively. Angela King, Assistant Director, Virginia Coastal Policy Center at William and Mary, let the audience know about the RAFT program. The Resilience Adaptation Feasibility Tool (RAFT) is a project of several Virginia universities that helps communities rate how well their planning documents take into account the impacts of coastal resilience, and assists them with developing mitigation measures. “Coastal resilience can be addressed in comprehensive plans by incorporating elements such as green infrastructure, open space preservation, infill development, the National Flood Insurance Program, the Community Ratings System and stormwater management,” reads a section of the RAFT scorecard. The project is a collaboration of the Institute for Environmental Negotiation at the University of Virginia, the Virginia Coastal Policy Center at the William and Mary Law School, and the Virginia Sea Grant Resiliency Program at Old Dominion University. Jonathan Miles, Ph.D., Professor, Integrated Science and Technology, James Madison University, and Director of the Center for Wind Energy, informed the audience about their program that assists farm owners in acquiring wind turbines to enhance their on-site energy production. The Center also sponsors a wind system contest for public schools and has helped with the installation of wind turbines at schools for educational purposes. He also noted that their Center will soon become the Office for the Advancement of Sustainable Energy. Resilient Virginia’s Rural Resiliency Forum was held October 23, 2018 at the Frontier Culture Museum in Staunton, Virginia. 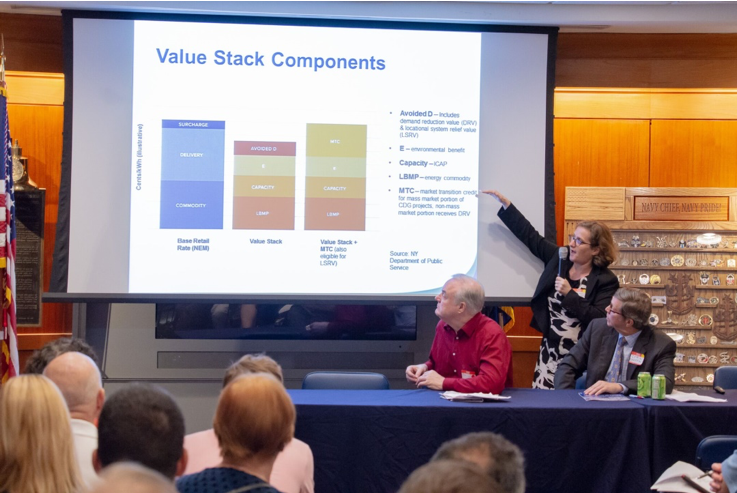 On October 4th, 2018, Leaders in Energy (LE), in partnership with Resilient Virginia, held its “Utilities of the Future Forum” at the US Navy Memorial in Washington DC. The event had over 80 attendees and was an exciting opportunity to look at recent developments in the role of utilities and future of energy provision and new changes. RELi, the U.S. Green Building Council’s new standard for projects designed to endure and recover from extreme weather, is a national consensus standard. It was developed through an American National Standards Institute (ANSI) process, and focuses on creating resilient buildings and communities. 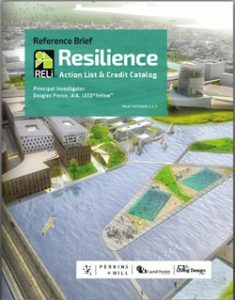 RELi (pronounced ‘rely’) is a comprehensive response to the urgent need for resilience in design and planning. Maintaining a reasonable level of safety and quality in our day-to-day lives now requires that we collectively respond to weather extremes, economic disruptions, and resource depletions — all of which are becoming commonplace globally, regionally, and locally. 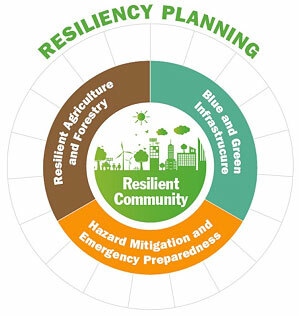 Resilience involves interactive social, economic, and environmental elements that respond to both acute short-term and systemic long-term topics related to the well-being of our society and planet. USGBC and GBCI have now adopted the RELI standard. GBCI and the RELi resilience standard will work together to develop buildings and communities that offer greater adaptability and resilience to weather and natural disasters. RELi’s development was led foundationally by the global architecture firm of Perkins+Will, with Eaton Corporation, Deloitte Consulting, and Impact Infrastructure providing vital content expertise and critical assessment. For more information on RELi, click here to view the RELi handbook online, or click here for information on a Resiliency Education Series event featuring Dan Slone. 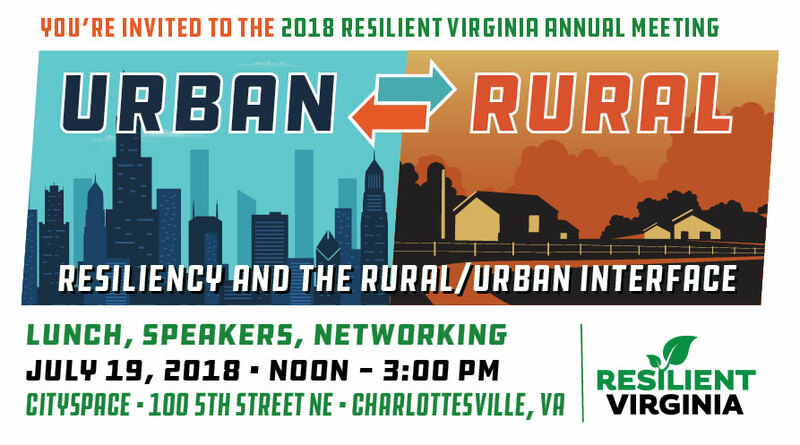 You are invited to Resilient Virginia’s July 19th Annual Meeting to hear more details about upcoming Resilient Virginia activities, to meet our Board and Advisory members, and to add your voice on local communities’ and state agencies’ resiliency priorities. $20.00 for members; $25.00 for non-members. ▪ Becoming a Member or Annual Sponsor. Skip Stiles from Wetlands Watch will present on the Collaborative Laboratory on Sea Level Rise and Flooding Adaptation — “Collaboratory” — a program to bring university programs with a community-based learning component (senior design/practicum/capstone studio, etc.) into the tidal localities in Virginia to work on practical approaches to adapting to increased flooding from rain and tides. The effort is a partnership between Virginia Sea Grant, the U.S. Green Building Council, and Wetlands Watch (a Norfolk-based environmental organization) and has been running for three years. The goal is to help localities find solutions while students gain real-world expertise in the growing area of practice around climate change/sea level rise. Past projects have generated many millions of dollars in implementation funding and participating students are gaining employment. The United Nations Climate Change Conference, the 23rd annual “Conference of Parties” (or COP23) took place in Bonn, Germany, November 6–17, 2017. Recent studies have pointed out the economic costs of rising temperatures, increased sea levels, and extreme weather events — all factors associated with climate change impact in the Southeast United States. 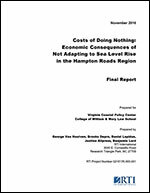 Costs of Doing Nothing: Economic Consequences of Not Adapting to Sea Level Rise in the Hampton Roads Region, a 2016 report from Virginia Coastal Policy Center, College of William & Mary Law School, narrows down the data to the Hampton Roads area. This report looks at several scenarios for sea level rise and the economic consequences. Business Resilience is the ability to rapidly adapt and respond to business disruptions while maintaining continuous business operations. Business resilience planning provides guidance for ensuring the ability to respond, resume, and restore to a pre-determined level of operation following a disruption. At FEA, we help our clients strive for resilience through comprehensive planning that takes a holistic and long-term view of the threats and their individual enterprise in order to ensure that the business is prepared to avoid, mitigate, and recover from adverse events. But, what were we doing ourselves? Were we walking the talk?